Building your own website can be a lot of fun, but on the other hand, it’s no laughing matter. A website is the world’s window into seeing who you are, what you do, what your purpose is, and whether you do it well. So when choosing a website builder to create your window to the world, you want to choose a good one. Of course, there’s nothing free in life, and a good website builder costs money. We compared Weebly’s pricing plans and how they rate in comparison to some of its competitors: Wix , GoDaddy , and SiteBuilder . Weebly is one of the top-rated website builders in the world, but it’s your decision as to whether the pricing and the features that each plan comes with meet your needs. 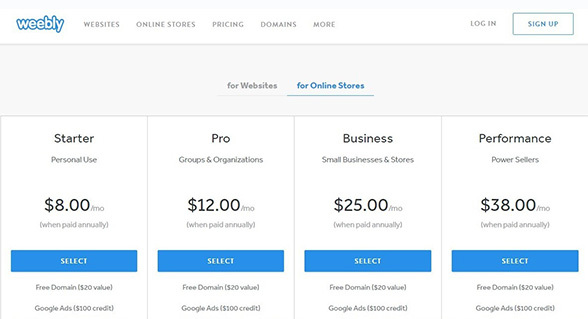 Weebly offers 5 different pricing plans, from free to complete online store manager. The type of plan you choose will depend on your needs and what you plan on accomplishing with your website. Excluding the Free Plan, all of Weebly’s offers come with $100 credit of Google ads, a nice little perk. The free plan is basic, and comes with drag and drop features, 500MB of storage, unlimited pages for your site, and free hosting. Any site you create with the Free Plan will, however, be under the Weebly domain and display Weebly ads; for business owners who are serious about selling online, one of the paid options is better. 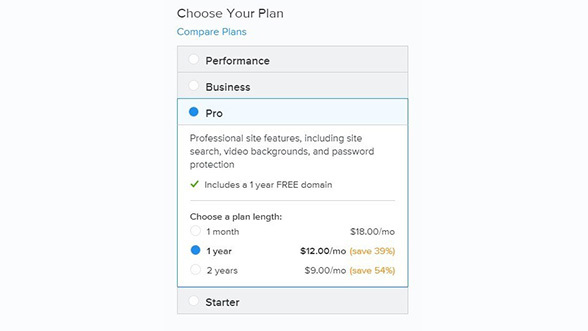 The Starter Plan costs $8/month for an annual subscription ($96 total cost), and it allows users to connect their own domain and remove Weebly branding. It also offers drag and drop features, unlimited storage, advanced site stats, and does not feature Weebly ads. Membership dues for the Starter Plan cover ownership of the domain for 1 full year. In terms of business, the Starter Plan allows users to post up to 10 products, and they are charged a 3% Weebly transaction fee. The plan also offers SEO, lead capture, a community forum, chat and email support, and checkout on Weebly.com. Weebly’s Pro Plan costs $12/month for an annual subscription, ($144 total cost) and it offers all the features of the Starter Plan, with the addition of professional features like site search, video backgrounds, password protection, HD video and audio, and up to 100 members. Pro also allows up to 25 products to be sold, as opposed to 10, and includes phone support in addition to chat and email support. The Business Plan costs $25/month for an annual subscription ($300 total cost), and it is meant for small businesses and stores. This is where Weebly starts getting serious. The Business Plan includes a 0% Weebly transaction fee, unlimited products, membership registration, checkout on the site’s own domain, digital goods, inventory management, shipping and tax calculator, coupons, and SSL security. The Performance Plan offers all of the above, plus RealTime shipping rates, abandoned cart emails, gift cards, and 5 email campaigns/month to 500 contacts. All of these features cost $38/month per yearly subscription ($456 total cost). To see a full chart of Weebly’s plans and the features that are included in each, scroll down. Monthly fees per year are the price you pay per month if you pay for the whole year in advance. So if you sign up for the Pro Package, you won’t be charged $12 each month; rather, you’ll be charged $144 in one shot, which comes out to $12 per month. If you want to pay each month and not one lump sum, the cost will be higher; in the case of Pro, it would then be $18/month instead of $12. For some, it can be difficult to dole out a large one-time sum, even if it may come out cheaper in the long-run. They may prefer paying a higher monthly fee in order to have the option of not committing to a yearly charge, or because they don’t have the money to pay a yearly sum at one go. Others, however, love the idea of paying a lower monthly fee for signing up for a yearly plan. For them, it means long-term savings and the knowledge that they will continue using Weebly for at least 1 year. For business owners, it’s good to have both options, because everyone has their own needs, business stats, and financial considerations. How Does Weebly Rate Against Top Competitors? When looking for a website builder, you don’t necessarily want the cheapest—you want the one that’s best for you. That’s not to say, however, that price doesn’t play a part. If you’ve gotten equally good recommendations for a number of sites, price may be the final factor that influences your decision. To help you out, we’ve compiled a table of 3 of Weebly’s top competitors, and how they compare to Weebly’s prices. Please note that each website has its own name for various packages; below we simply put general labels on similar plans of each website. As you can see, for personal use, Weebly is on the more expensive end of the spectrum, but for business use, it’s on par with most of the other sites. For intermediate business needs, it’s even on the lower end of the spectrum. Whether price is your main consideration or not, it’s important to remember what you are getting for the price you pay. If you are getting everything you need, it may not matter to you if you’re paying a bit higher than other sites. On the other hand, if you’re not getting what you need, it doesn’t matter how cheap the service is—it will be useless! So the first step before price comparison is to figure out what you need, and then to go ahead and look at the various pricing packages and what they come with. Sometimes, spending a little extra money can save you time, frustration, and heartache. On the other hand, if you find what you need at a lower cost, all the better! The important thing is to be armed with knowledge; with knowledge, you can never go wrong.